Your Essential Cocktail Making Class is just the right amount of fun, education, food and of course, alcohol. Spend around 90 minutes learning some of the tricks of the trade from Professional Mixologists. Your Essential Cocktail Making Class is just the right amount of fun, education, food and of course, alcohol. This cocktail lesson makes for a brilliant event for a multitude of occasions, in particular, Hen Parties. How long does it last? Spend around 90 minutes learning some of the tricks of the trade from Professional Mixologists. You'll learn to shake, stir, toss and pour a classic Mojito and a Cosmopolitan. This Cocktail Making Class includes a Prosecco ready on arrival as well as a Jaeger - bomb rally to close out, plus a bite to eat in the middle. Where can I do it? 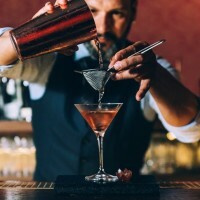 The Cocktail Masterclass is available throughout the UK in most major cities including London, Liverpool, Manchester, Newcastle and more! Click here for more available destinations. Where will it take place? The events usually take place in an instantly recognisable bar. What time? Cocktail Making Classes start at 12, 2, 4 or 6pm and require a minimum group size of 6. All packages include at least 4 drinks in total, two of which you'll make yourselves. Vegetarian and non-alcoholic options available, just let us know when booking.